I am seeking information on the 1969 Firebird body tag or cowl tag. 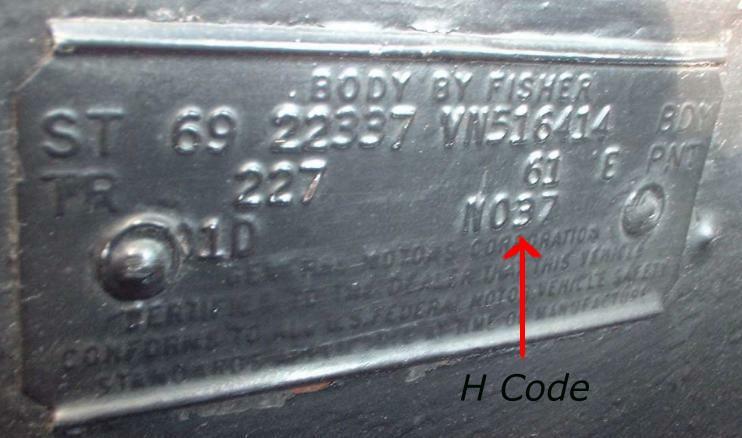 There is a 4 digit code usually at the bottom of the body tag that is relatively undocumented. I am trying to gather some tag information for as many 1969 Firebirds as I can. I would like to get your pictures of your cowl tag also. I will update this site when I determine some pertinent information from this. Below is a picture of a 1969 tag with the info on it. Usee this form to decipher your Body Tag found on your 1969 Pontiac Firebird. 1. Use the pull down menus to match your Body Tag (also known as Cowl Tag). 2. Select or type the information that matches your Body Tag. 3. Make sure all information matches your Body Tag exactly or the results will not be accurate. 4. * Pay extra attention to the pull down menu next to the "ST - 69" (i.e. - 22337=coupe, 22367=convertible). Most of the information is based on these numbers. 5. * You need to include all the numbers on the body tag. Specifically the Paint Code which should not be more than four characters long (i.e. 65, 65B, or 6565). 6. The H code is the most important part of this form. This would be like the N037 in pic above. 7. Please Input Your Car's VIN. I need this to better correlate the tag info. 8. Click on the "Submit" button. * - Indicates where most people have been making mistakes. Not the number on your trim tag!!! APPLICABLE AT TIME OF MANUFACTURE.